Do you struggle to ensure agreement between disparate accounting systems within your organization? Many finance professionals do, and it costs big business millions a year in labor to manage the reconciliation process. From error-prone manual procedures to accounting anomalies across a growing software stack, the modern reconciliation process demands intelligent computing power, and integrated systems. Business Solution Partners empowers businesses with the software, processes and training necessary to master reconciliations - giving your company a stable financial foundation from which to grow. With continuous accounting and an automated close process, you can maintain financial integrity and free valuable human resources from labor intensive and error prone tasks. In The Next Few Fiscal Quarters? 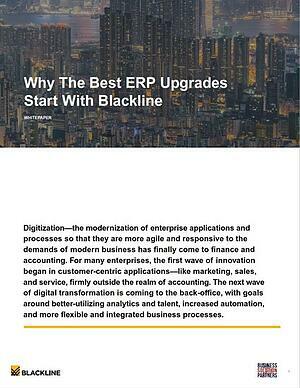 Download this important whitepaper to see how Blackline can transform the way accounting approaches disruptive software upgrades. Today's lightning fast SaaS solutions are dramatically transforming reconciliations and the close process, giving your finance team time to concentrate on more important tasks. Every business, in every vertical, can benefit from adopting the practice of Continuous Accounting, and the Continuous Close. Our reconciliation solutions focus on better close management; a smarter close process, strengthened key controls, and the ability to monitor your closed status. We help companies ensure financial integrity, with scalable solutions that support growth, not hinder it. We appreciate the pressing need to transform and modernize reconciliations and the financial close process. Our team has the knowledge, insight and thirty years’ experience to help you streamline operations and achieve this goal for your organization. Our staff of CPAs and Consultants are reconciliations management experts and specialize in working with NetSuite and Microsoft Dynamics clients for a seamless integration. We implement, customize and help you succeed with BlackLine, providing strategy, software and training. If your company is serious about mitigating risk, eliminating error-prone manual accounting processes, and gaining a better overall picture of your financial health, work with Business Solution Partners to implement Continuous Accounting and the Continuous Close, and transform your business with Blackline.